Theos Bible College is a Theologically Accredited, educationally accountable institution of higher learning. Our primary purpose is to equip God’s People for the Work of Spiritual Ministry (as compared to institutions designed to prepare people for secular fields of endeavors). For that reason, TBC has chosen to be accredited through the Accrediting Commission International. ACI is an internationally known, non-profit, Christian church educational organization. They handle the accreditation of Christian theological seminaries, universities and colleges around the world, providing oversight and supervision for almost 300 institutions in 8 countries and in 38 states within the USA. Accreditation is a term most people are familiar with hearing but don’t really understand the inner workings of. To that end, here is a summary of what “accreditation” is and how it operates in the United States of America. Simply understood, accreditation in the U.S. is established when an institution of education voluntarily submits to an accrediting agency’s standards of high academic quality, accurate record keeping and ethical policies and practices. In essence, Accreditation is a statement of approval by an outside agency of oversight. In reality, the vast majority of Bible Colleges and Seminaries choose not to be governed by the secular oversight of the USDE and, accordingly, do not seek their regional accreditation. Because we believe we should not allow secular institutions to dictate the qualifications for programs, content (i.e. Philosophies, cultural dictates, revised societal norms, other ideologies) and instructors for a spiritually-focused ministerial degree, Theos Bible College has chosen not to seek governmental school accreditation. Instead, TBC has chosen to submit to ACI (as outlined above), which serves religious educational institutions around the world function in an accountable system of accreditation that is not under the dictates of a secular government. 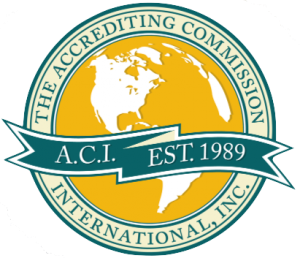 The form of ministry accreditation provided by ACI is recognized by most churches, ministry institutions and ministry organizations. All ACI member institutions around the world accept credits from other member schools, if the credits apply to their programs. Finally, TBC offers academic programs specifically designed to equip students who feel God’s call on their lives and who are working toward building a life of ministry. The programs offered by TBC are not designed for persons working toward secular careers. It is the responsibility of prospective students to ascertain the acceptability of the credits and degrees offered through TBC which may be accepted at the discretion of the evaluating institution, company or agency being pursued.